When it came down to choosing a fun 160cc motorcycle, the Suzuki Gixxer was our pick of the lot. It made a lot of sense for those who wanted to ride to the hills on Sunday and commute to work on a Monday. 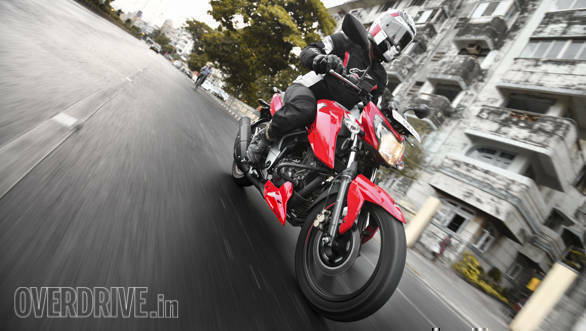 There's a new motorcycle in the segment now, the TVS Apache RTR 160 4v; one that promises this and a lot more. Will the reigning champion of the segment have cause to worry then? The Suzuki Gixxer has been around for quite some time now and as a result, the styling is familiar. I'm still a fan of the way the tank is shaped, with a generous knee recess to lock into the bike and the upswept design of the tailpiece is reminiscent of Suzuki's litre class nakeds. That said, I'm not a big fan of the graphics on the SP variant that you see here. It seems out of place and a simple, two-tone design would have done the job. The build quality, as well as fit and finish, is as good as any other Suzuki and from my long-term ownership experience, I'm sure that the bike will age well. 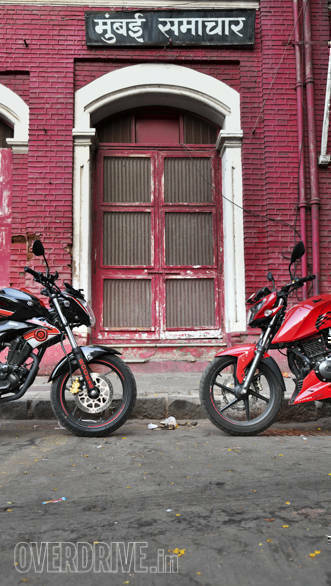 The TVS Apache RTR 160 4v is cast from the same mould as the Apache RTR 200 4v, albeit the tail section, and that's a great place, to begin with. 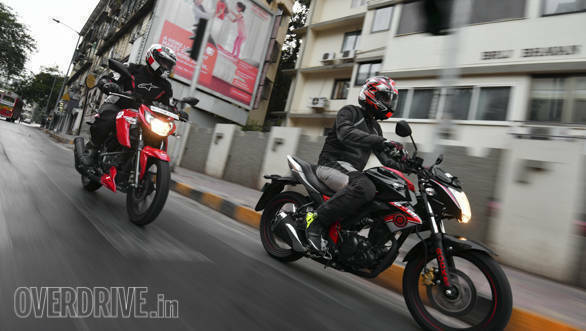 The Apache looks sharper and bigger than the Gixxer. The wide seat, as well as the large tank, gives you a feeling of straddling a bigger motorcycle. 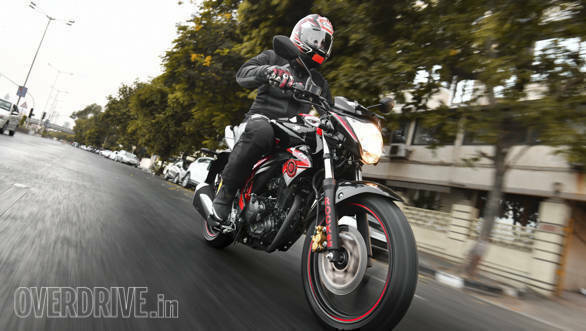 The single-piece handlebar is set a bit lower and the riding position is a tad committed, compared to the relatively upright position on the Gixxer. The Apache feels equally well built as the Suzuki, whether it's paint finish, switchgear quality or even the way the bikes are put together. 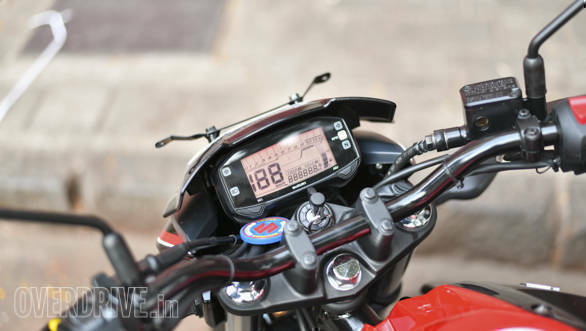 Both motorcycles offer the digital instrument consoles with a bar graph type rev counter at the top. The Gixxer's unit, however, has a useful gear indicator that's not available in the carburetted RTR 160. Why TVS, why? One of the reasons why the Gixxer trounced the competition in every comparison test before this, was its refined and solid engine. While its 14.5PS @ 8,000rpm and 14Nm @ 6,000rpm figures is lower than the competition, its the way the way the power is delivered that makes the Gixxer pretty entertaining to ride. It's peppy nature and eagerness to rev to the redline, coupled with the strong low and mid range grunt allows you to filter through gaps in city traffic with ease. It's only past the 90kmph mark that the engine begins to lose steam and sounds strained. The TVS' oil-cooled 159.7cc motor has a slight displacement advantage over the Gixxer and its 16.8PS @8,000rpm and 14.8Nm @ 6,500rpm figures are the new class benchmark. What I really like about the motor is its stellar refinement. 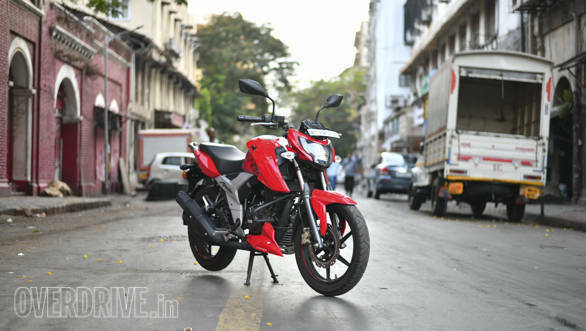 It is almost as refined if not more than the Gixxer's 154.9cc mill, across the whole rev range. It is the calmer engine of the two as well, and though it may not feel like it, the TVS gets up to speed as quickly the Gixxer. This has to do with the linear power delivery as opposed to the urgent rush of power from the Gixxer's motor. 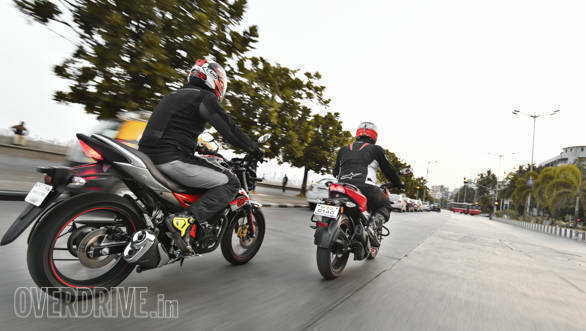 While there's barely any difference between the 0-100kmph time of the Gixxer (16.74s) and Apache(16.61s) and it's the relatively stress-free nature of the Apache's engine that makes it the happier motor of the two at sustained high speeds. For those who desire performance without sacrificing on fuel economy, the Apache will keep you happy at the pumps which are commendable given the fact that it weighs 10kg more than the petite Gixxer. Both motorcycles employ diamond frames with the engine as the stressed member. The Gixxer has a fatter front fork and both motorcycles utilise a monoshock at the rear, but that's where the similarities end. The Gixxer's setup is on the stiffer side and not very good at dealing with big bumps and potholes. But the tradeoff is the fantastic handling that I absolutely love. The Gixxer was my long-term bike a couple of years ago and I clearly remember how sharp and surefooted the little Gixxer felt. Its short wheelbase (1.330mm) also makes it super flickable and paired to a communicative front end, the Gixxer is a sweet motorcycle. 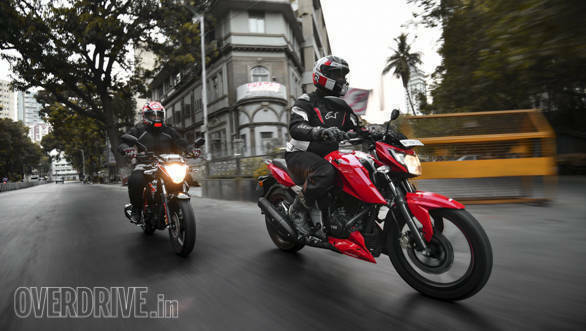 That said, it's the TVS Apache that has moved the game forward and how. The Showa tuned suspension feels spot on for our varying road conditions. Form minor undulations to craters, the Apache seems to iron the gamut of imperfect roads with aplomb. And, in the corners, it inspires tonnes of confidence. It doesn't tip as quickly into a corner as the Gixxer but it feels more planted throughout the entire sequence, all the way to the exit. That's not to say the difference in handling is stark but the TVS does have an edge over the Gixxer. Both bikes here have a twin disc setup and are quick to shed speed. The TVS' additional weight and longer wheelbase, however, lends it more stability under hard braking. I wish both manufacturers would've been proactive and offered ABS as an option, at least rather than waiting until April 2019 when it becomes a matter of compliance. The Suzuki Gixxer is such a lively motorcycle that it's hard to ignore it. Its peppy motor, lightweight and flickable nature makes it a delight in the city and if that's the boundary that you are going to stick to, the Gixxer still makes a lot of sense. 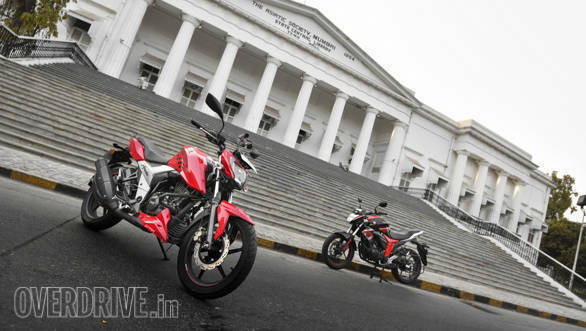 As much as we love the Gixxer, it is dethroned by the TVS Apache RTR 160 4v. It is equally well built, makes more power and handles better when you turn the wick up. And it does all of this in a calm manner. At Rs 95,237 OTR Mumbai, the Apache is priced a shade below the Gixxer SP (Rs 97,000) and that pretty much seals the deal in favour of the TVS, the new segment king!.